Anyone else wanna share their green hop recipes? This is the beer I shared at the last meeting. Most of the comments I heard indicated this was a true-to-style, balanced Cream Ale, but not overwhelmingly hoppy. It would need a lot more late additions and dry hops to really showcase the green hop aspects. 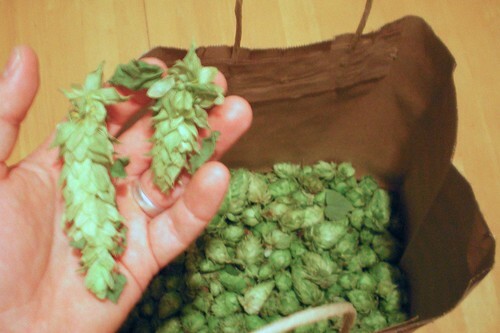 I’ve grown my own hops for years, but I’ve always dried them before use. This is my first attempt at a green hop brew, so I selected a fairly neutral but authentically American base style. 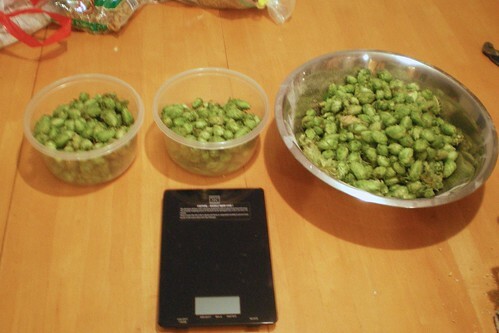 4 US Gallons = 3.3 Imperial Gallons = 15.1 Litres, a reduced batch size to make the most of my small 15-ounce green hop harvest. *I have a personal theory that popcorn, which must possess very specific properties in order to “pop”, is probably still the closest we have to pre-Columbian Native American corn/maize, and much less genetically modified than other commercial sweet corn varieties. I selected yellow instead of white because it contains more healthful beta-carotene. STRUCK grainbed with 2.5 US gal/2.1 Imp gal/9.5L water ≈ 159°F/70.6°C to reach the first mash temp. Stirred-in a sprinkle of Calcium Carbonate. After an hour, I added .75 US gal/.62 Imp gal/2.8 L boiling water to reach next temperature rest. MASHED at 148°F/64.4°C for 60 minutes, then 158°F/70°C for 30 minutes. SPARGED ≈ 172°F/77.8°C to collect 6.5 US Gal/5.4 Imp Gal/24.6L pre-boil. This took about 40 minutes. I moved my keggle to the propane burner, lit the flame, and it took 15 minutes to reach a full boil. BOILED for 60 minutes, dropped-in Irish Moss and the immersion chiller at 15 minutes remaining. The groundwater was warm because of the heat-wave we were having. Even with the immersion chiller, it took about an hour to reduce the temperature to my target. Hopefully the steeping time gained me yet more hoppy aromas. I drained the keggle into a bucket-style fermentor, and blasted it with a drill powered paint stirrer for insane aeration, then pitched the yeast. Fellow homebrew club member, Jason, came over to help/hang-out. He brought his own excellent Oktoberfest lager and Dark Amber ale. Timothy, another recent member, showed-up later bringing his dangerously drinkable Earthy IPA (>8% ABV). I don’t have a rule against drinking while brewing, but geez I think they were trying to get me drunk! Most of the cones were normal-sized, but look at these freaky monsters!